Glenrio in TX & NM, is a ghost town that straddles the Texas - New Mexico state line; its Main Street is a Historic District along U.S. Highway Route 66 listed on the National Register of Historic Places. Visit the Ghost Town with its State Line Bar and Motel, the Texaco Gasoline Station, Little Juarez Diner. When the railway built the station it named it Glenrio but no reason was given. Apparently the name combines two words of two different languages, just like it spans two counties in two different states: the English word "Glen", which is of Scottish origin, borrowed from the Gaelic word (gleann) which meant "mountain valley". Glen in English is "Narrow Valley", and the Spanish word "Río", which means "river"
So Glenrio is "narrow river valley". The only flowing water in the area is Trujillo Creek, one mile west which flows north into Canadian River. By the way, the 1917 book "Railway Connections and Junction Points..." by Richard Henry Gray, writes it using two separate words: Glen and Rio. Elevation: 3.850 ft. (1,174 m). Population: 0 (2010 census). Time zone: Central (CST): UTC minus 6 hours. Summer (DST) CDT (UTC-5) for the Texas part of town and Mountain (CST): UTC minus 7 hours. Summer (DST) MDT (UTC-6) for the New Mexico side of the town. Glenrio is a ghost town that straddles the Texas - New Mexico state line; it is a Historic District listed on the National Register of Historic Places. It is the first town on the old US Route 66 when entering Texas from the East, 73.1 miles (118 km) west of Amarillo; and it is the first town in New Mexico coming from Chicago. It is unincorporated both in Quay Co., NM and Deaf Smith Co., TX. The formal location is Texas State Highway Loop 504 and New Mexico State Road 1578, both of which are actually the alignment of U.S. Route 66. The Panhandle area has been inhabited for over 10,000 years. "Clovis" type stone tools of that age have been found 80 mi south of Glenrio, in Clovis NM. In the 1540s, the Spanish "Conquistadors" explored the region searching for the mythical city of gold (Eldorado), but found only endless plains. The native Comanche and Kiowa Indians would live in peace until the mid-1800s. White settlers began moving into the area after the U.S. incorporated Texas and this caused problems with the Indians, leading to a war (1874 - 76), their defeat and enclosure in reservations. The first settlers arrived in 1905, when the tracks of the Chicago, Rock Island and Gulf Railway were extended west of Amarillo. The station was built in 1906 and the local ranchers shipped their produce through the station's depot. The station was in Texas, but the town spanned the state line. Erastus "Deaf" Smith (1787 - 1837), was born in Duchess Co., New York, and lost his hearing due to a childhood disease. He settled in San Antonio, Texas in 1821. He joined the Texas Revolution and fought, and was wounded in the war against Mexico. Sam Houston described him as follows: "A man, more brave, and honest never, lived". The New Mexican side of Glenrio had a post office but the mail arrived on the Texas side of the border. By 1920 the town had grown and had a hotel, cafes, stores and service stations it even had its local newspaper, the "Glenrio Tribune" (1910 - 1934). U.S. highway 66 was created in 1926 and it passed through Glenrio. A welcome office was set up at the state line. The town weathered the Great Depression and Route 66 travelers contributed to the local economy. By 1940 the population was 30. In those days Homer Ehresman, a local businessman, ran a service station, tourist court (motel) and grocery store. Business was very good during the 1940s and 50s. The road was widened in the 1950s. 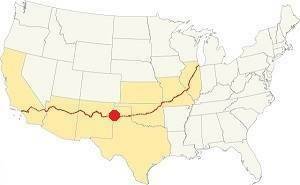 But when I-40 was finished (1973), moving Route 66 out of town in 1954, bypassing Glenrio, it began its decline. The railway depot had been closed in 1955, and business moved elsewhere: the Ehresmans went to Endee, NM, and Charles Jones relocated on I-40 in Oldham County. The railway and post office closed in the 1980s and by 2000 only five people lived in Glenrio. It had become a Ghost Town. The closest town with hotels is Vega: Motels and Hotels in Vega. Alternatively you can lodge in the next big town in Texas, Amarillo: Hotels and Motels in Amarillo or in New Mexico, to the west, in Tucumcari. or in Tucumcari (New Mexico). What is the Weather in Glenrio? Where is Glenrio on U.S. Hwy. 66? The weather in Glenrio is dry and sunny: rainfall averages 18 in per year (460 mm). Summer has highs (from June to September) that are above 90°F (30°C), and average lows of around 66°F (19°C), the average temperatures in winter range from 49°F (10°C) to 24°F (-4°C). Snow falls during the period between September and May and is most frequent after December. The high terrain provokes greater snowfall (around 19 inches yearly with peaks that exceed 40”); 45 to 102 cm. The region around Glenrio is among the windiest in the continental U.S.
Tornadoes, this is Tornado Alley, read more: Tornadoes on Route 66. Glenrio is the first town after entering Texas from New Mexico; it is right on the state line. It is 73 miles west of Amarillo along I-40, and It is 176 mi (284 km) west of the Texas - Oklahoma state line. In New Mexico are: San Jon (18 mi. ), Tucumcari (42 mi) and Santa Rosa (102 mi.). Albuquerque is 218 miles away. Check out Glenrio on our Route 66 Map of Texas, with the complete alignment and all the towns along it. Color key for that map: Pale Blue: Historic Route 66 alignment through Texas. Click on the following link and see our overview of Route 66 across the state of Texas. Below you will find full details on Old Route 66 in Glenrio. The classic sights in town! A ghost town set on the TX-NM state line whose Main Street (US 66) is a Historic District listed on the National Register of Historic Places. National Register of Historic Places, Listed: 2007. The Historic District is defined by Historic Route 66, Glenrio TX and NM. The Historic District preserves several vintage gasoline filling stations, motels and diners of the period when Route 66 was the main road through the Panhandle region of Texas, between 1926 and 1976. Soon after the railway linked Glenrio with the rest of the country, cars began arriving. They followed the roads marked and promoted by the Ozark Trails Association (1913). The Glenrio Hotel began accommodating guests who arrived by car along the Ozark Trail. A dirt track mostly unpaved, muddy and dusty winding across the country. The map predates Route 66 and shows the Route 13 that preceded it; notice that Glenrio is written with two words: Glen Rio. U.S. highway 66 was created in 1926 and it followed the alignment of Route 13, through Glenrio, becoming the bloodline of the town. There was a Texas Welcome Station by the state line, on the south side of the road. A non-verified myth says that it was a location of the 1939 film "Grapes of Wrath" (click on link for full details on the book and the movie). The north side had one motel and several gas stations as well as a motel by the early 1930s. Cars would queue up to fill their tanks at the local service stations. The 70s saw its demise: I-40 bypassed the old downtown Main Street and trade moved elsewhere. 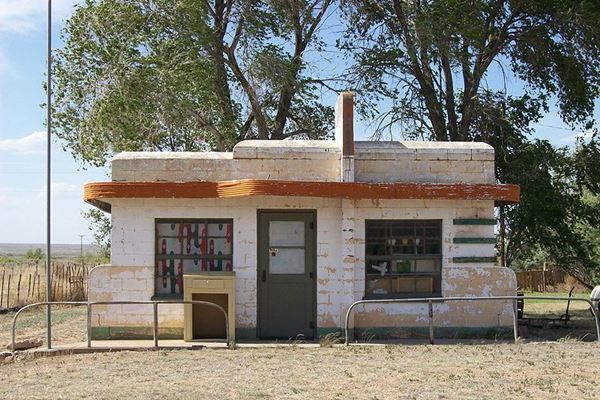 The Glenrio Historic District encompasses not only the original Old Route 66 roadbed but also 17 abandoned buildings. Many are simple utilitarian constructions, but several are quite unique; we describe them below. The State Line Bar and motel were built in New Mexico in the 1930s because Deaf Smith County in Texas was dry at the time. You can see them next to the state line, in NM, on the north side of the road. (See Street View). The local post office can be seen on the north side of US 66 in New Mexico. 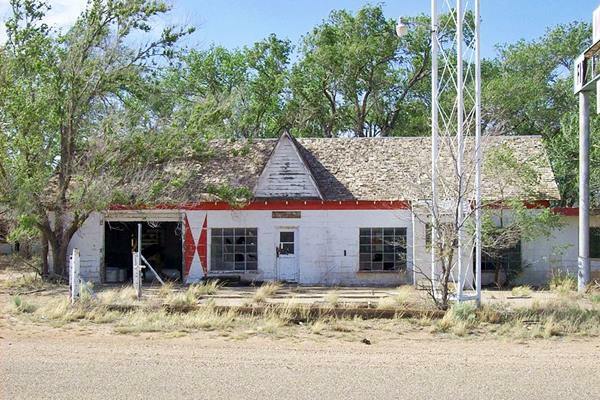 A square block of a building, it, built circa-1935, was in New Mexico, 0.2 mi from the state line, it is the westernmost building in town. The town's water supply came from a tank and windmill built in 1945. Interesting Streamlined design on this 1950 building: curved vertical panels on the upper part of the canopy. New Mexico had a high state gasoline tax, so the service stations that were there moved to Texas. 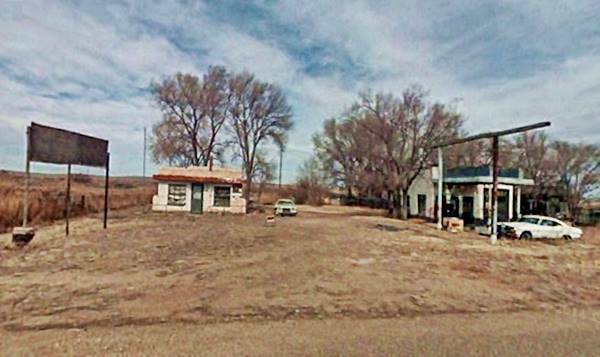 At one time there were three filling stations in New Mexico: Broyles Mobil station (1925), Texaco (ca. 1935) and Ferguson Gas Station (1946). On the north side of US 66, next to the Texaco service station. Another empty building along the mother road, dusty, silent, remembering better days. It was a diner: Brownlee Diner ⁄ Little Juarez Café (1952). The Joseph Brownlee House, next to the service station was built in Amarillo in 1930 and taken to Glenrio in 1950. The diner is the box shaped building to the west of the gasoline station, and it has a clear Art Moderne design: take note of the rounded metal canopy, with horizontal lines or the curved tops of the walls, and the crest in the middle of the building, as well as the tips of the front wall; curved and streamlined. Art Moderne or Streamline Moderne, was popular in the 1930s and evolved from Art Deco. Its main features are: curved shapes with rounded edges, horizontal lines or grooves in walls, flat roofs, smooth wall surfaces (plaster) and pale beige or off-white colors with contrasting dark trims. Disney Pixar animated film Cars (2006) included an abandoned building designed along the lines of the Little Juarez Café which later becomes a racing museum. It also portrays a vacant "Glenn Rio Motel". Homage to this historic town. North side of US 66, right beside the state line. This motel was a kind of "Last Chance", Glenrio was 41 mi. east of Tucumcari, NM, and 73 miles west of Amarillo, TX, a long distance for cars in the 1940s, especially cars lacking air conditioning during the hot summer months. It is just east of the Texas - New Mexico State Line and is, the Last Motel in Texas going west and the First one for those heading east. In fact, it is the last building in Texas, the border runs right against the motel's western wall. It sported a sign reading "Motel, Last in Texas" greeting those arriving from Amarillo and another, facing west: "Motel, First in Texas" luring in weary travelers coming from New Mexico. It is in disrepair, overgrown, cracking ceiling, linoleum floor tiles peeling off, scattered remains of a happy past, when this town received, fed and comforted travelers on their way to California or Chicago. It was owned and built by Homer Ehresman, and his family ran the business between 1953 and 1976. The concern included the State Line Café and Gas Station (1953) and the Texas Longhorn Motel (1955). From the downtown area (mile zero) on Amarillo Boulevard and Pierce Street in Amarillo, head west (left), the road crosses the railway (1 mi) and after a right turn, you access SE 6th Avenue, which is TX-279. Keep straight as the road becomes SW 6th Ave. There is an underpass (2.3 mi) and a slight change in the direction of the 6th Ave. (2.9 mi), and it enters the Historic Sixth Street District. Keep on 6th Ave and turn left into Bushland Avenue (3.9 mi). The road has a southwesterly course and after the underpass at Bell Street (5 mi) turn left onto West Amarillo Blvd. (which is the Business Loop of I-40). The road will take you past the Veteran's Hospital and cross Coulter Street (5.8 mi). It then heads west and crosses TX 335 (7.4 miles) and enters the town of Soucy, where you can see (8.5 mi) the Historic Helium Plant. Shortly after you must take a right onto the Old alignment of Route 66 (9 mi) along Indian Hill Rd. If instead you head straight towards I-40, you can visit the Cadillac Ranch, which is on the south of I-40 (10.3 mi). You can only reach it from I-40. Stay on Indian Hill Road and take a left on Hill Road (12.6 mi) enter I-40 and head west. At Exit 57, (14.7 mi) is the town of Bushland. Keep on the frontage road of I-40 passing Wildorado (23 mi), at Exit 49. Continue along the north service road, which at Exit 37 keeps straight west while I-40 opens to the left to bypass the town of Vega. You will enter it along I-40 Business W - US 66, and reach the outskirts of Vega (35.1 mi). Stay along the road (now Vega Blvd.) drive past the Main St. (35.7 mi). (some intersting sights here!). To leave the town head west along Vega Blvd., don't get on I-40 at Exit 35 (37.3 mi), instead kepp on the North frontage Rd to reach the "Ghost town of" Landergin. It is located by Exit 28, (43 mi), the the remains of a small town (more on Landergin). After Exit 23 - 22, the road becomes I-40 Business again and goes into the town of Adrian (49.7 mi), which is the midpoint of Route 66, half way point between Chicago and Los Angeles. Leave Adrian and pass Exit 18, Co. Rd. 18 and Gruhlkey (54.7 mi). Drive west along the Frontage Road which here follows the old Route 66 and takes a wide curve nortwest following the old railway. It meets I-40 again at Exit 15 (57.3 mi.). Get back on the I-40 and leave it just before reaching the New Mexico state line, at Exit 0 (72.5 miles), go south till you reach the Old Route 66 alignment And turn right to reach Glenrio (73.1) set upon the Texas - New Mexico State Line. There is a very modern Welcome Center on the Interstate 40, just after the Texas - New Mexico state line. Get Full information on the Historic segment between Glenrio and San Jon, which is listed in the National Register of Historic Places. The Old highway 66 continues west, from Glenrio, into New Mexico. It was the original alignment to San Jon until 1952 but the road turns to a gravel surface after half a mile from the Texas state line: Quay County removed the paving to cut maintenance costs, so now it is a gravel road. On the Glenrio to San Jon segment are two ghost towns: Endee and Bard. H. Allen Anderson, "Glenrio, TX", Uploaded on June 15, 2010. 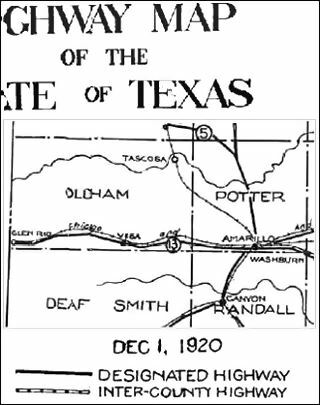 Handbook of Texas Online, Published by the Texas State Historical Association.